Moria Elea Deluxe is the perfect gift idea for every special occasion, personal or business! 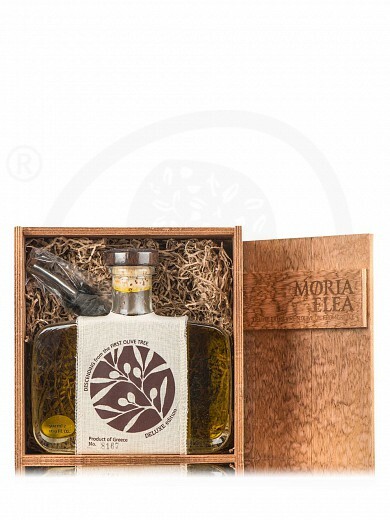 Moria Elea Deluxe is a blend extra virgin olive oil (50% Manaki & 50% Koroneiki, PDO Kranidiou) with rich aromatic character and pungnent attributes of medium intensity. Moderately bitter. Well balanced with harmony in its robust olive flavor. The olives are hand-picked. They are pressed daily using the cold extraction method at 22oC for 35 minutes. The olive oil is stored in stainless steel containers at a constant temperature of 15oC and filling introgen. Limited edition of 10.000 numbered bottles per year. Olive Vision is a company established in 2011 by Kostas Balafas and George Dimarakis. Though fairly new, Olive Vision is a fast-growing company with expertise and specialization in producing, standardizing, and trading extra virgin olive oil. Olive Vision’s founders are not strangers to the field. They have coupled their love and devotion for olive growing and olive making with their long-standing marketing know-how to arrive at the crafting of “Moria Elea”, a range of exceptional extra virgin olive oils. They have set their heart not only on crafting a product of excellence but also on pampering their consumers with a one-of-a-kind gourmet experience. To do so, they are growing Koroneiki and Manaki, two of Greece’s best olive cultivars, in the family olive groves in Ermioni, Argolida, in sunny southern Greece where their storage and standardization facilities are also located. The production process starts with olive growing, continues with the harvest, and ends with the crafting of the olive oil, its storage, and bottling. Under the guidance of a team of experts and following a rigorous pattern of soil, water, and leaf analysis, Olive Vision goes on to implement the best and safest growing practices, all anchored on an Agricultural Production Integrated Management System. Depending on the olive variety, harvesting takes place between mid-October and late December and never before the olives of each variety have reached their perfect point of maturity. The olives are then hand-picked with great care so as not to have their sensory traits compromised. 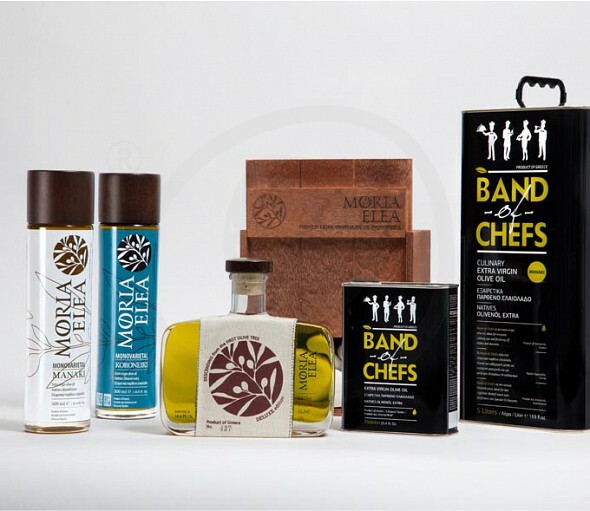 The end result is “Moria Elea”, a highly acclaimed extra virgin olive oil which has been the proud recipient of many an international award both for its quality and its elegant packaging. Extra virgin olive oil crafted in Ermioni, Argolida and produced in the limited quantity of 10,000 numbered bottles. Made for those who expect the utmost gourmet moments from their extra virgin olive oil!